When I noted yesterday that the South Ferry Terminal opening has been postponed, I reported that this delay was due to some testing. It turns out the station won’t open for a few more weeks because of one whole inch. The grand opening of New York City’s first new subway station in 20 years is being delayed by an inch. Transit officials say the gap between the platform and the train at the $500 million South Ferry subway station is an inch too wide in some places, exceeding the three inch maximum allowed by federal regulations. 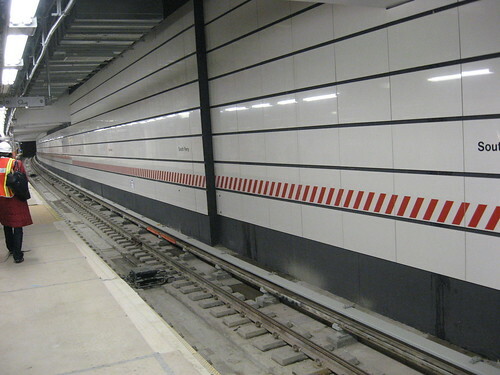 To fix the problem, authorities plan to install wider rubbing boards, a plastic strip that protects the platform edge from swaying trains, a three to four week job. Only in New York do we get excited about the “first new subway station in 20 years”… and it’s actually a *replacement* of an existing station. But who wouldn’t be excited about a new subway station? what worries me is that this somehow cost 500 million dollars, and now they’re band-aiding a gap that’s too wide, I hope they know what they’re doing. > But who wouldn’t be excited about a new subway station? As for this station, “mildly interested” is a more accurate description of how I feel. “Excited” would call for something a little more substantial… the opening of the SAS, for example. Shrinking? How so? Over the last twenty years, we’ve neither added nor subtracted, and the city hasn’t geographically expanded in that time either. shrinking in terms of lost options for one. City Hall, Worth, 91st stations all shuttered. Lost trackage in terms of the Els. Platforms shuttered as well at numerous stations. I am thinking of all the els that were torn down. The Third Avenue el would have come in handy the last couple decades. I am not familiar with the Bronx so I can’t say if the portion that went through the Bronx (and was torn down in the 70s) was “needed” or not (actually I have a hard time believing that a line through the center of the Bronx would have low ridership, not to mention all the els in central Brooklyn that were torn down). I suspect instead that they just let them deteriorate to the point where it was “cheaper” to tear them down. I don’t mind the closed stations like 91st and City Hall: they closed for good reasons. But the Els were a tremendous loss of mass-transit capacity, plus the South Ferry shuttle, the Culver Shuttle, etc. On top of that, the mainline rails lost stations and route-miles in Brooklyn, Queens and the Bronx. There were sound reasons for closing down the Els, but new subway lines were supposed to replace them—and to date those lines have not been built. I feel like Charlie Brown after Lucy pulls the football away again. why does it take “three to four weeks” to install strips of plastic? All large construction projects have delays, unexpected costs, contractor errors and design errors. What seperates a good project from a bad project is the project management. I work as an electrical designer for the State of New York and I deal with similar issues all the time. 1) Was this gap screw up a contractor error, a design error or a combination of both? What sort of post project debriefing will be held to draw out the lessons of the project so that they can be applied to future projects? 2) Are MTA contractors working under positive incentives, like completion bonuses and negative incentives like liquidated damges per day past the completion date? 3) The MTA now has enough “mega projects” underway, that it should be able to create a more realistic formula for predicting cost overun percentages and schedule overruns. 4) Does MTA Capital Construction have an Engineer in Charge/ Project Manager/ Construction Superintendent on site at all times there looking out for the MTA’s best interests? 5) What sort of independent review of the design documents does the MTA perform? Is there a detailed and thorough review by qualified design personel not directly involved in the actual design to provide a sanity check for the design? 6) In regard to the gap issue, why can’t they just shim out the existing rubbing boards with something that doesn’t have to be custom made. Like stick some medium density fiberboard, plate steel, or a couple of washers in there and be done with it. Those guys at MTA are just a bunch of dopes to actually allow this type of crap to happen. Ultimately they are definately responsible… it goes to show that a lot of things nowadays are just NOT being done like in the good ol’ days- with integrity versus passing the buck as many do today. There is so much corruption, deceipt and “it’s-not-my-job mentality” among many organizations across the board; and that’s one of the main reasons why our economy is in such bad shape today. The same attitidue permeates our entire society…. so we shouldn’t be surprised that people are now producing at the same capacity as workers in Third World nations like Ecuador- slackers! Nobody gives…..
Perhaps whosoever is responsible should just simply- hang, the way they used to do it ages ago, in places like Rome or in the Middle Ages across Europe. I know, I know… that won’t get the project fixed any faster, but at least that way, in the past when heads rolled (literally) those “bad” genes were kept out of the “good” gene pool, and ensured our species’ overall EVOLUTION. Oh Jason wants the station at City Hall opened. Beautiful historic property. Wait until you see the gaps down there. There was no ADA when that was built. Look at the picture, it is a curve. The cars on the train make a chord, a different geometric concept. There will always be a gap, fine tuning, precision movement, with real good modern equipment on that track layout you can hold it to three inches. But Jesus “bunch of dopes”, over three weeks and $200,000? I have to ask, even though this was several years ago: What exactly was the distance between the outermost platform edge (at the tip of the rubbing board) and the track center, on tangents? For years on IRT platforms it was designated as 4′ 7¾”, but one site I saw claimed the distance to be as much as 4′ 8¼” which would indeed pose a potential hazard for passengers either boarding or disboarding trains. PATH got it right – their specs call for a universal distance between platform edge and track center of 4′ 7½”. This is especially relevant given that all IRT cars now running have a universal width (from the outer side door threshold) of 8′ 9″ (or 4′ 4½” if measuring from car center to outermost edge); the last with such width of 8′ 9½” – the so-called “Redbirds” – were retired a decade ago. Apparently, 1 inch or slightly more is how the platform width to the face of the rubbing board is how the standard for IRT platforms on new stations has been adjusted since the modification of the gap at the new South Ferry terminus (I can’t get an accurate reading because there is a slight radius curve, but it would appear if based on a tangent to be 4′ 6½”). As noted above, for years the MTA had the width to the face of the rubbing board for IRT station platforms set at a minimum – a minimum!!! – of 4′ 8¼” (when the Jerome Avenue wing of the IRT Lexington Avenue line was opened around 1917, an Engineering Record article – prior to its combining with Engineering News to become Engineering News-Record – cited a width of 4′ 7¾”). Apparently they have since learned their lesson, since in checking the platform width of the 34th Street-Hudson Yards terminus of the #7 line, it appears to come in at an even 4′ 7″ – seven inches closer to the track center line than on IND / BMT platforms with their standard of 5′ 2″ to the face of the rubbing board.